The world relies on the Haber-Bosch process to reduce atmospheric nitrogen to ammonia to make fertilizer, pharmaceuticals, and other industrially important chemicals. But the process consumes a tremendous amount of energy—about 1% of the world’s electricity every year. A new light-driven catalyst could dramatically reduce the temperature needed to drive the reaction, according to computer simulations (Sci. Adv. 2017, DOI: 10.1126/sciadv.aao4710). A predicted molybdenum-gold catalyst splits a dinitrogen molecule. Credit: Adapted from Sci. Adv. Dinitrogen molecules contain one of the strongest known chemical bonds. To break those bonds, the Haber-Bosch process must run at temperatures above 400 °C. 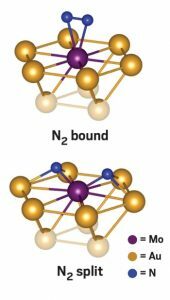 John Mark P. Martirez and Emily A. Carterat Princeton University propose a gold-molybdenum catalyst that could split the nitrogen triple bond at room temperature using energy from visible light. That dissocation step is the primary limit on the reaction rate in the Haber-Bosch process. Their proposed catalyst relies on a phenomenon called surface plasmon resonance, in which the valence electrons on a nanoparticle oscillate in unison when excited by a photon. Harnessed correctly, that excitation energy could push the nitrogen dissocation reaction over its high activation energy barrier, Carter says. 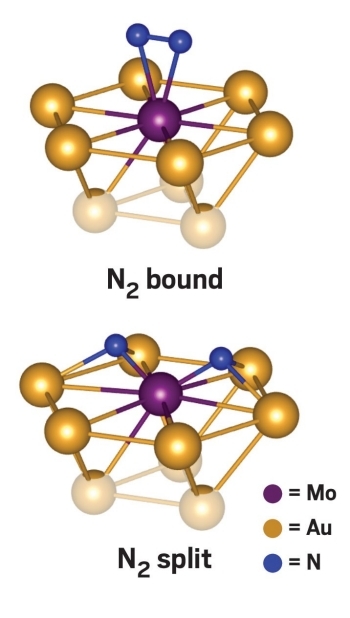 She and Martirez proposed using gold nanoparticles, which absorb visible light to produce surface plasmon resonances, and then doping the surface with molybdenum, which can grab onto and split nitrogen molecules. The researchers evaluated the catalyst’s potential using a computer simulation technique that Carter developed, called embedded correlated wave function theory. They used it to predict the course of the dissociation reaction for nitrogen in different excited states that are accessible at gold nanoparticle plasmon frequencies. The calculations suggest that the catalyst can lower the energy needed to split nitrogen by about 80 to 90%. “It should be possible at room temperature and with visible light to break the nitrogen bond,” Carter says. She noted that the catalyst may also allow for another source of energy savings: lower operating pressures during the reaction. The researchers next need to demonstrate that their nitrogen-reducing catalyst can work as predicted. “This is the very type of theoretical predictions the N2 photoreduction field needs to challenge the experimentalists,” says Mercouri Kanatzidis of Northwestern University, who has researched nitrogen-splitting photocatalysts in the past. Carter collaborated with Naomi Halas and Peter Nordlander of Rice University on an earlier hydrogen-splitting catalyst, and says she may work with those two again to test this predicted nitrogen reducer. The nitrogen-splitting catalyst may still be unproven in the lab, but Carter is already thinking about more ways to use surface plasmonic resonance. She says she’s collaborating with Halas and Nordlander on another classically difficult reaction: activating the carbon-hydrogen bond in methane.